From the Director's Desk. Whew - that was September? This month I have a truly eclectic mix for you! Even though Snopes says this piece is a 'fake' I though that it would be worth sharing! It purports to be from the late Steve Jobs who died of pancreatic cancer. After reading this "Jobs' piece (regardless of its true provenance) I am reminded to wish not only you our Jewish readers but ALL of you another year of life, love, health and happiness. (While ZBC was very busy planning a hike those of you who are our Jewish readers, donors and supporters celebrated the arrival of the Jewish calendar year 5779, observed Yom Kippur - the Day of Atonement - and wished each other G'Mar Chatimah Tovah - a wish to be inscribed and sealed in the book of life for the coming year). Flushed with the success of the 16th Annual Dipsea Hike for Zero Breast Cancer we are deeply touched and honored to share news with you that we shared with the hikers a little over a week ago. It concerns a bequest to Zero Breast Cancer that you can learn more about in the next segment of this newsletter. We love surprise gifts, but we also like to plan for the future. If you have listed ZBC in your will or trust, please let us know! When medical practitioners forget their Hippocratic Oath to 'First do no harm"
It gives us no pleasure to read about a medical doctor being censured but in this case we feel we should share this information. Combination hormone replacement therapy (estrogen + progestin HRT) is a known risk factor for post menopausal breast cancer. 70% of breast cancers are hormone receptor positive and evidence based treatment of such existing cancers and prevention of recurrence of such cancers depends on blocking and/or reducing the levels of such hormones in the body. Replacing these hormones - whether they are artificially synthesized or bio-identical from 'natural sources' - has not been proven safe. Read more here. Know anyone who might be interested in part time employment as a Study Coordinator for Community-Based Participatory Research Study on Breast Cancer Prevention, Breast Cancer Over Time? BCOT is a tax-exempt California nonprofit corporation created and controlled by breast cancer survivors and dedicated to supporting scientific research into breast cancer prevention. The job description and information on the application process can be found here. Information about the study can be found here. Reader, perhaps you share some of ZBC's ambivalence about the 'pinking' of October and the arbitrariness of it being Breast Cancer Awareness month? Hopefully you will appreciate the partnerships we do promote and the activities we participate in to do our bit in an authentic and meaningful way. Please visit our calendar and check out the ever-growing variety of events that include local supporters and businesses raising money for ZBC and a myriad of opportunities that ZBC takes advantage of to spread our education and awareness messages about ways to lower breast cancer risks in our communities. AIFF 1775's 5th Annual Fire & Ice Cream event at Lappert's Ice Cream in Sausalito on October 7th. Pinxav (Pink Salve) has selected ZBC as the beneficiary of a donation for every website sale during the month of October. So if you know any one with a baby in diapers who might need a really good diaper rash creme please tell them about Pinxav. 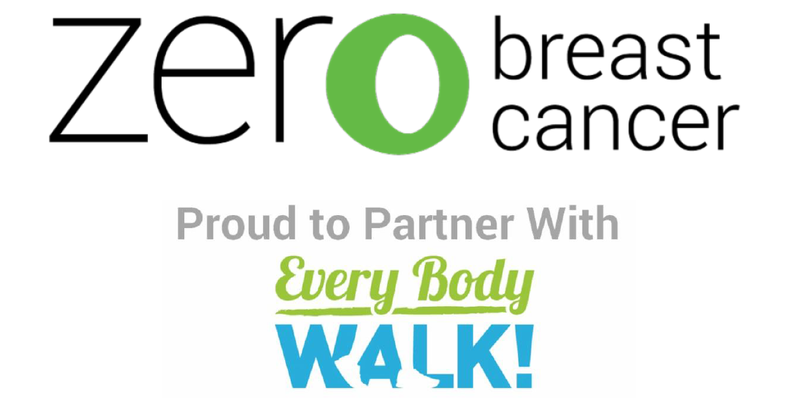 Zero Breast Cancer is happy to announce that Lianna Hartmour has transitioned from part time Education Coordinator to (almost) full time Program Director here at ZBC. Lianna will be focusing on youth, teens and pregnant women as populations who may be particularly susceptible to environmental and lifestyle factors that may impact their lifetime breast cancer risk. Lianna will take a leading role in extending the reach of ZBC's activities beyond Marin into the rest of the North Bay in 2019. Sports Basement has added ZBC as a beneficiary organization to its Basementeer program year round! Thank you! It just remains for me to once more thank you for your longstanding support of Zero Breast Cancer and your ongoing commitment to the ultimate vision of a world with zero breast cancer. PS Its never too late to become a monthly donor to ZBC. Its easy and you can start the process here! Zero Breast Cancer Announces a Significant Bequest from the late Marjorie Bonner in Memory of her daughter, Andrea Fox. Late last year, ZBC learned that Marjorie had passed away just two days before the 15th Annual Dipsea Hike, although we did not know it at the time. Over the next several months we learned that Marjorie had made a major bequest to ZBC in honor of Annie’s memory. ZBC's Board President, Melissa Felder, publicly announced the bequest at the 16th Annual Dipsea Hike for Zero Breast Cancer immediately prior to oberseving a moment of silence in memory of Annie and all the women from our community who have been claimed by breast cancer. This moment of silence was also observed both in memory of - and gratitude to – Marjorie for supporting ZBC's mission now and in the future. This is a huge vote of confidence in ZBC and we will steward this gift with great care to make an impact. You can read more about Majorie, Annie and the bequest here. A wonderful event enjoyed by all. The beauty of nature. The benefit of exercise. The solidarity of community. The fierce determination to focus on breast cancer prevention in the next generation! Thank you hikers, donors and dedicated, willing, cheerful volunteers. You all rock! For an initial selection of hike photos click here. Still want to make a donation to support the Hike for Health? You can do so here all through 10/31/18. Thank you! NEW: Book Review # ? Sorry no September book review! VOLUNTEER SPOTLIGHT : Salesforce Swag Stuffing Saviors! Shout out to Cathy Mastrioni for taking the lead in assembling a delightfully enthusiastic team of Salesforce volunteers to stuff 18 items into 300 swag bags in about an hour on Friday 14th September, 2018. Part of our focus is to make sure that people Move More & More Often and swag stuffing is as good an opportunity to do so as any other! You were such good sports sprinting around the board room table here at 30 N. San Pedro Road to get the job done in a uniquely ZBC way! Also in this picture are Alyssa Amaral, Noel Burgess, Katie Gillespie, Laura Pedersen and Cindy Terme. Thank you all!